We checked in a large room with two large beds. Quickly we freshened up as we had to visit the Madurai temple and come back and sleep early since we had to catch an early bus next morning to the next location - Sathuragiri Hills. 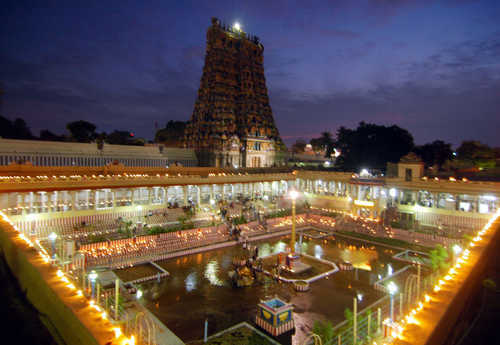 Madurai temple was an important location because this was the divine Meenakshi Amman shakti temple or Meenakshi Sundareshwar and more important because inside this temple was the Jeeva Samadhi of the great Siddha Sundarar. 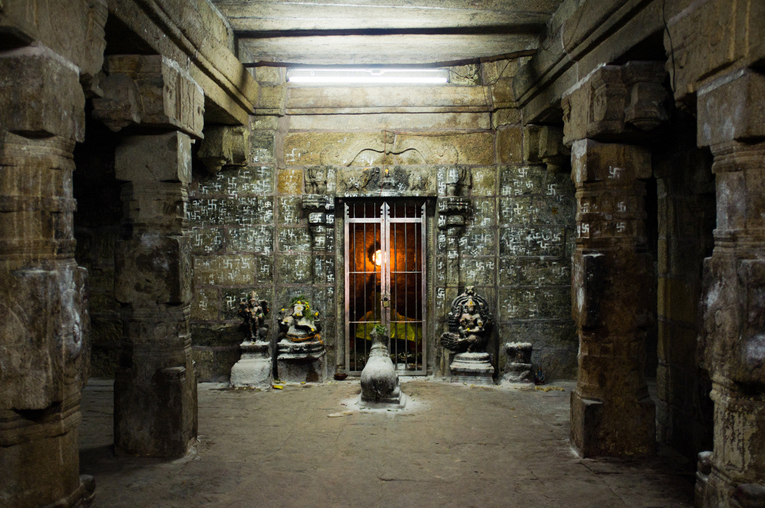 It is our regular endeavor to trace Jeeva Samadhis whenever we see an ancient temple in the South for 90% chances are that there will be a Jeeva Samadhi, most of the time even unknown to visitors. This is a great secret down South. The Samadhis did not come after the temple, most of the time, temples came after Samadhis or over Samadhis. If you see an ancient temple in the South, there has to be a Jeeva Samadhi in the garba griha or below of near the main diety or Shiva Linga, or somewhere close to the sanctum of the temple. Here in the Madurai Meenakshi Amman temple, the Siddha Sundarar is in Samadhi just to the right side of the main santum. After locating it, we sat in meditation very close to the loving energy of this Master. It was closing time by the time we got up and moving through the huge tall pathways, we came out of the main temple into the huge compound holding many other mini-temples. 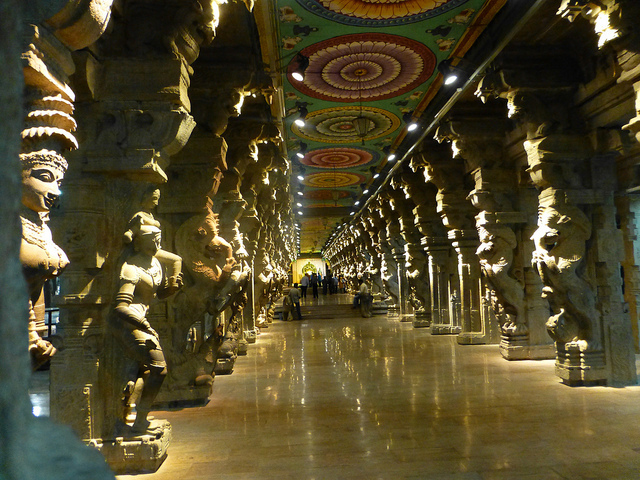 This is one of the most magnificent temples with huge corridors and beautiful structures and carvings. After moving slowly through the thinning crowd, we were out and asking an auto guy to drop us to our hotel. The real fun was when the auto guy asked which hotel and we all looked at each other - none remembered the name. We searched frantically for a visiting card in our pocket but in vain. Everyone walked slowly not knowing which direction to go, all busy thinking the name of the hotel or atleast a close name. Finally, we remembered that it was just opposite to the bus stand. We asked another auto guy and he asked which bus stand. It was then that we realized that Madurai had four main bus stands. We were in a fix. We kept walking on a street and asking people and luckily we found the hotel key in one of our pockets. We then asked people of this hotel near a bus stand. Not many new. Suddenly, one old gentleman came to our rescue and told us that it was near Periyar Bus Stand and he said that we could take a bus. He was so kind that he walked with us till the bus stop a few meters away and he stood there until he ensured that we had got in the right bus back to the hotel. We thanked him heartily and reached our room in about half hour. We preferred walking into the main bus stand that was just walkable distance from our hotel room. We wanted to ask which bus could take us next morning to our next destination - The Sathuragiri Hills - the holy four hills of thousands of Siddhas both in physical and subtle form. Some asked us to take a bus to Srivilliputhur and get down at a mentioned stop and some said we could take a bus to Wartrap. This was a bit isolated location as not much of commercial movement happens this side. Even if we would take a bus, it meant we would still be dropped on the main highway and we still had to take some transport medium another 10 kms just to reach the foothills of Sathuragiri Hills. 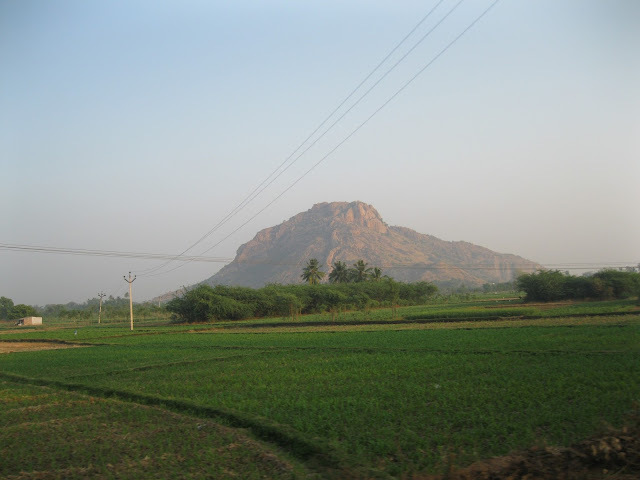 From there the trek was around 11 kms to reach the Mahalingam Temple situated at the top. We wanted to know at what time would the bus services begin and we were delighted to know that bus services never stop and that they are many buses throughout the night. We walked back to our room preferring to take the a bus at 4 a.m. Off to bed we were with alarm waking us up from 4 a.m. as each had quick showers and packed our stuff and checked out. The check out was quick because the we had cleared off everything last night and had to only hand over keys. The climate was beautiful with cool breeze as we entered the bus stand that looked like it had never slept since ages. Buses were constantly moving in and out and so were people. We asked for the Wartrap bus and someone said it had just left. This was the bus that could take us to the closest part of the foot hill. We then saw a bus to Srivilliputhur and got into it as we were advised to get down at a stop called Krishnan Kovil. From here we had to go to Watrap and from there take whatever medium available to reach the foot hills. The morning journey was beautiful as i continued taking pictures from the large windows of the bus and at the same time enjoying some music in my ears in between reading the prints i had taken about this place and at times getting into meditative stillness and at times taking power naps. In about three hours we reached the Krishnan Kovil stop and we got down. It was about 8 a.m. and we decided to have breakfast at this place in a hotel that served hot idlis and sambhar with chutneys. Relishing this snack along with some sip of coffee, we got out of the hotel and asked for guidance to Wartrap and someone pointed out to a bus stating it would take us there, and it did. This bus was a totally bumpy ride for us with hundreds of inverted-speed breakers. In about 20 minutes we reached Wartrap. By now the not only the population had thinned out but so also were the roads. We looked around and it seemed to be the outskirts a very small village having crossroads. Everywhere we looked around was empty land and farms and in a distance beautiful mountains. These were the sacred mountains of the Holy Siddhas that connects the mountain of Siddha Agastya Maha Muni ji and in the same stretch of these mountains is the famous Sabrimala Hills (abode of Lord Ayappa). These mountains actually separate Tamil Nadu and Kerala. 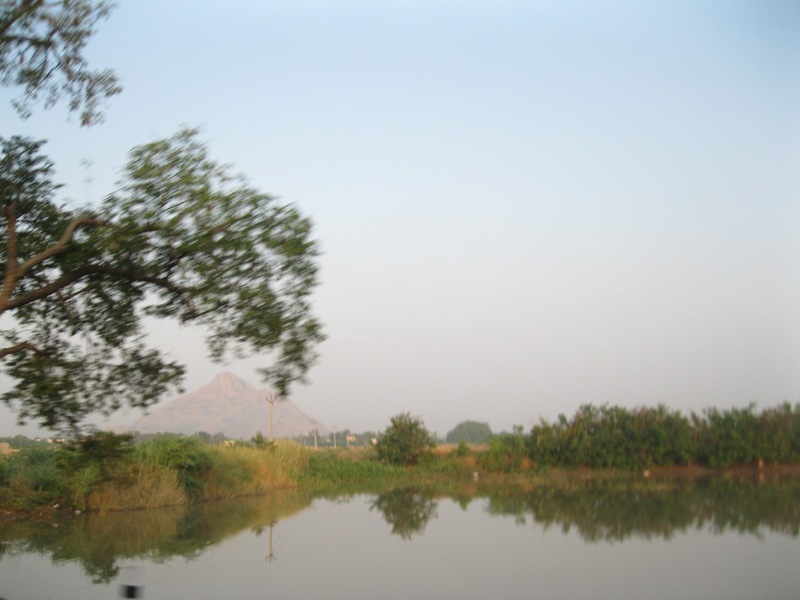 The Agastya Malai (mountain) likes half in Tamil Nadu (Kanyakumari district) and half Kerala (Tiruvananthapuram), which was the hometown of my father of this birth too.